20—GEAR Production Supplement F E A T U R E tool, eliminating a substantial cause of hobbing machine downtime. Unlike processes where absolute information such as "tool breakage" or "missing tool" is suffcient, gear hobbing requires continuous monitoring to ensure that tool wear is held strictly within specifed tolerances. Artis has developed a new feature for the monitoring function to optimize the gear hobbing process. It is successfully in operation at ZF Friedrichshafen AG in Saarbrücken, in the company's production of high-quality automatic gearboxes. At Saarbrücken, ZF develops and manufactures six- and eight-speed automatic gearboxes for medium and luxury cars. The model 8 hp eight-speed automatic gearbox contains four sets of planetary gears and fve shift elements for a total of 20 to 25 gears. With an annual production of 2 million gearboxes, the gear cutting machines are in continuous operation, and reliable processes are required. Process Parameters The process monitoring system uses the milling spindle torque measurement to obtain information about the condition of the tool. The torque curve for a known good tool is "taught" once and then compared with the actual machining process. The result is displayed as a curve with the area below the curve representing the acceptable value for the operation. Tool breakage shows up as an anomalous "spike" in signal intensity. Normal wear can be tracked as well, and displayed for the operator. By setting experience-based limits on the tool's "signature" it is possible to predict the remaining life of the tool. This reduces downtime, and enables maintenance and resharpening to be done based on actual tool condition rather than on a time- or part-based schedule. Tool cost savings can add up to fve-fgure sums within a few months. The system is able to optimize cycle time by monitoring the load during the cut and maintaining the highest practical metal removal rates compatible with machine capabilities and desired tool life. 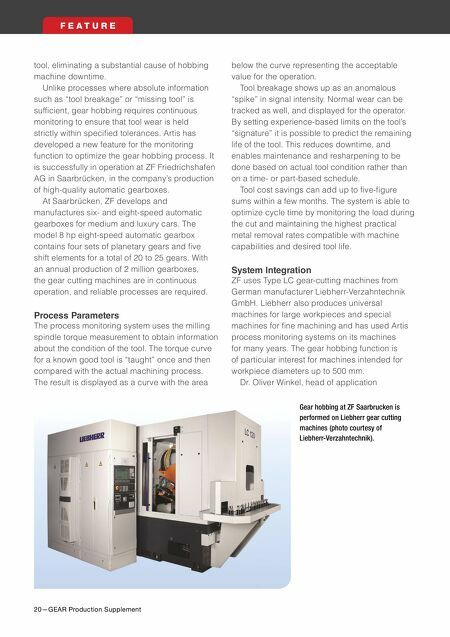 System Integration ZF uses Type LC gear-cutting machines from German manufacturer Liebherr-Verzahntechnik GmbH. 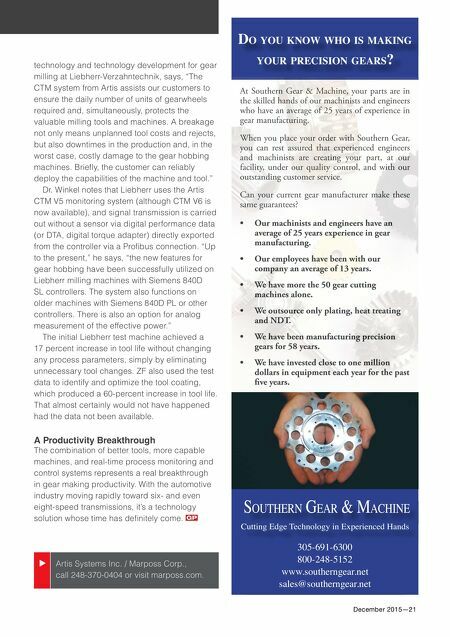 Liebherr also produces universal machines for large workpieces and special machines for fne machining and has used Artis process monitoring systems on its machines for many years. The gear hobbing function is of particular interest for machines intended for workpiece diameters up to 500 mm. Dr. Oliver Winkel, head of application Gear hobbing at ZF Saarbrucken is performed on Liebherr gear cutting machines (photo courtesy of Liebherr-Verzahntechnik).